Korean style grilled beef is served with green onion salad, a mixture of bean paste and hot pepper paste called “Ssam Jaang”. You wrap it all up into a leaf of lettuce and pop it into your mouth. You can dip some pieces of cucumber and carrot into the spicy paste. Cut beef into bite-sized pieces, ½ inch in thickness, and put them in a bowl. Add 1 ts of salt, a pinch of ground black pepper, and 1 tbs of sesame oil and mix it with your hand. Set it aside when you’re done. Make ssam Jaang (dipping sauce) by mixing the following ingredients: 1tbs of hot pepper paste, 2 tbs of soy bean paste, ½ tbs of sugar, 1 clove of minced garlic, 1 tbs of chopped green onion, 1 tbs of sesame oil, ½ tbs of toasted sesame seeds. That’s it! You made a very nice dipping sauce! Rinse the sliced green onion in running water. Drain it and set it aside. Make sauce by mixing 2 tbs of soy sauce, 1 tbs of hot pepper flakes, ½ tbs of sugar, 1 tbs of sesame seeds, and 1 tbs of sesame oil. Add the green onions to the sauce and mix it up with a spoon. Slice up a dozen of cloves garlic (each clove should be sliced 3 or 4 times) and place them in a small bowl. Cut carrots and cucumbers into bite-sized sticks for dipping. On a heated grill or pan, drizzle some sesame oil to prevent meat from sticking onto the grill and to give it good flavor. 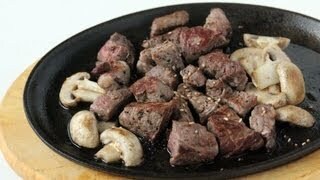 Add chunks of meat and sliced garlic using your tongs and cook. When it’s cooked, wrap a piece of beef and garlic in a leaf lettuce. Add some dipping sauce and pop it into your mouth. All you can do is chewing and enjoying the delicious taste! Don’t forget to think about me while enjoying the food! Posted on Thursday, July 12th, 2007 at 4:16 pm. Last updated on April 26, 2015. Posted April 4th, 2014 at 4:40 am | Log in to reply. Posted September 2nd, 2013 at 6:17 am | Log in to reply. I found you in youtube when I was researching for korean food recipes. It’s a good thing there’s a Korean store in Manila so I was able to buy ingredients and cooked your grilled beef, emergency kimchi, bibimbap and pajeon for my family and they loved it! Thank you for sharing your recipes. Keep up the good job! Posted September 2nd, 2013 at 3:00 pm | Log in to reply. Posted August 24th, 2012 at 7:16 am | Log in to reply. Dear Maangchi, i have a question about ssamjang. Can i substitute doenjang paste with japanese miso paste? All our family can’t have gluten, but all doenjang that i saw in our shops contains wheat flour :( Thank you for your reply! Posted August 24th, 2012 at 9:11 am | Log in to reply. Japanese miso sounds great to me! Posted July 15th, 2011 at 4:36 pm | Log in to reply. Ssam jang is pretty much the favorite sauce around my house now. It is divine on any meat, or even fried tofu. I add a little cooking wine to mine (Chinese style since that’s what I have) and use brown sugar most of the time, because that’s all we usually keep in the house for coffee. Posted May 17th, 2011 at 1:22 am | Log in to reply. Hi Maangchi! I recently discovered your youtube videos and now your blog and I love them! I was wondering what size and brand your chopping board is? I’ve been looking for a chopping board but having a hard time figuring out what size and brand I should get. You’re looks like a perfect size. This recipe was originally posted on July 12, 2007 at 4:16 pm by Maangchi. It was last updated on April 26, 2015. The video was watched 261,411 times on YouTube & has 849 likes!